Randi worked briefly with a caterer while her kids were young. It was there that she learned to make fruit baskets and decorative sweets. Not too long ago, we celebrated my grandson's first birthday. It was a hot day in May and I wanted something refreshing, pretty and both our Vegan/diet friendly. 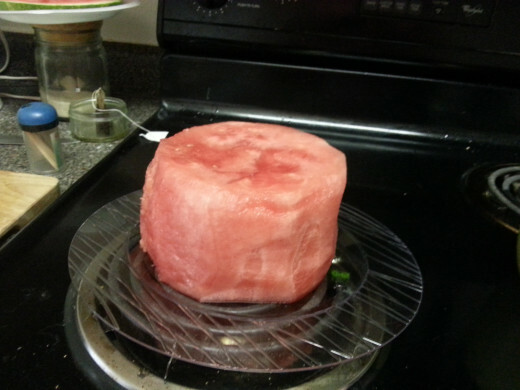 I decided to try making a watermelon cake. I must admit, I wasn't too sure how it would come out since I am not a talented baker. Well, that's the beauty of it! You don't have to be a skilled baker or cook to make this. It turned out to be easy to do and looked professional! It was most definitely not time intensive and didn't take any special skills. Follow these easy instructions and you will have a beautiful, healthy "cake" to be proud of! I made my first watermelon "basket" over 25 years ago. After that, I was hooked. I loved making melon balls to fill them with and carving elaborate handles. I added flowers and other decorations to them, as well. Almost two years ago, I made a bassinet watermelon basket for my daughter's baby shower. That was also a hit! The benefits of a watermelon cake over a traditional cake. all fruits can be substituted according to season and taste. Wash and chill all the fruits you will be using. Clear a big enough area for preparing your cake. 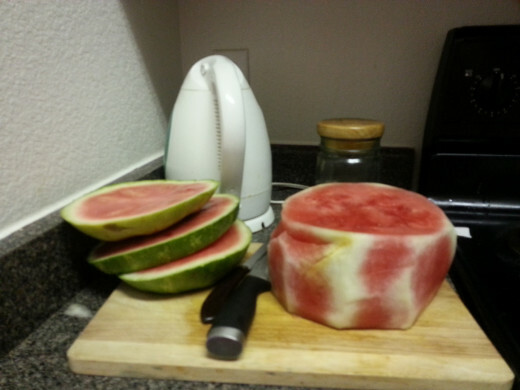 Cut the top and bottom off your watermelon. I also made watermelon "pizzas" so I cut 1 more slice off both the top and bottom of the melon. Make sure your melon sits straight on a flat surface. Cut away the rind. Don't worry about how neatly you do it. 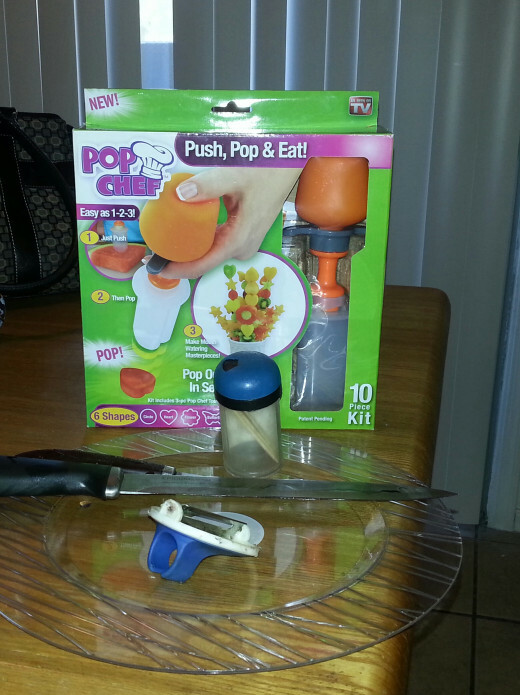 Your next step will be to smooth down the side, I used a vegetable parer to smooth the sides of my melon. After smoothing the melon, put it on the platter you will be serving it on. 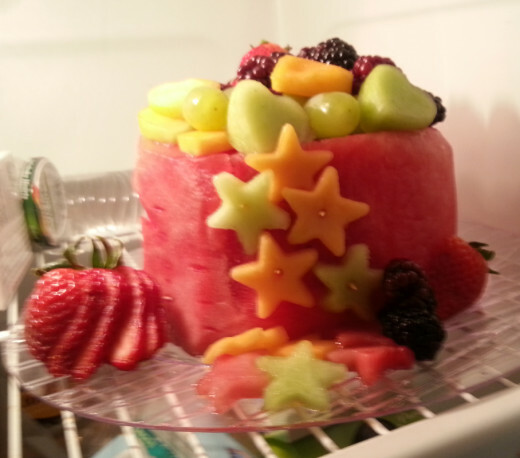 I put it in the fridge while I cut the fruit to decorate it with. Get all the fruit cut up and ready. This is when I also cut the fruit for the kabobs. Mix the sugar with enough water to make it sticky but not runny. The consistency should be a little bit thicker than a sugar glaze. Spread glaze on the watermelon. Begin to put the fruit on it. You will need to add glaze as you go, so the fruit will stick to the melon. Toothpicks will also come in handy to keep the fruit in place. Put your finished cake back into the fridge to chill. 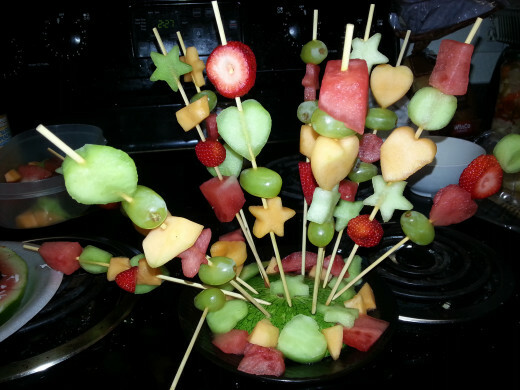 You can now begin the fruit kabobs. We used the top and bottom of the watermelon as the base for the kabobs. They were perfect to display our creation! I also made a pizza. I put the watermelon slices on platters. I sed halved blackberries as sausage, strawberry slices as tomatoes, purple grapes as olives, manderin oranges as sweet pepper and sprinkled shredded coconut on top for cheese! I sprinkle lemon juice on everything to keep the fruits from getting brown. They also add a little more flavor! A low fat, low calorie cake. 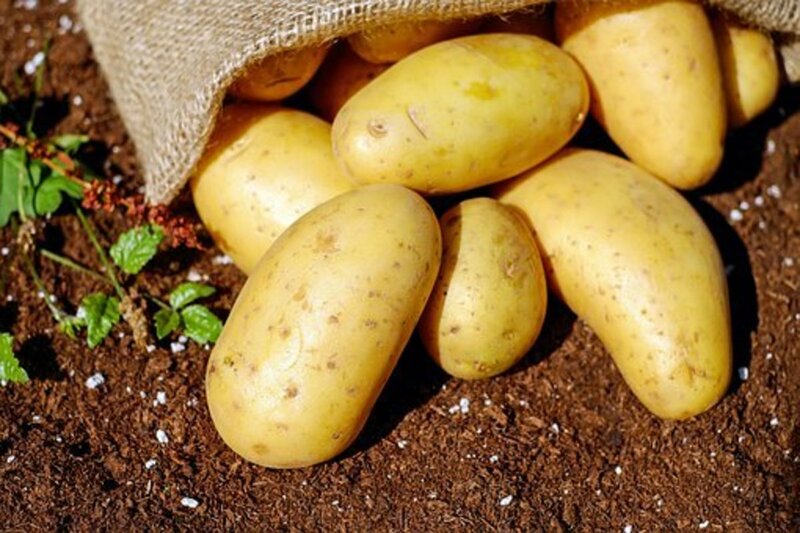 While this particular recipe is very low fat and calories, there is a variation that would make those calories shoot up. Some people choose to frost or ice their watermelon cakes. 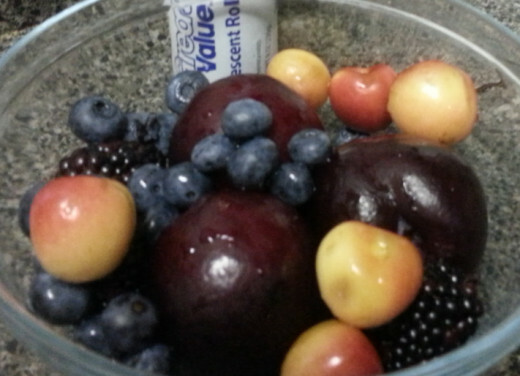 Because I made mine for a vegan crowd, as well as wanting to keep it healthy, I chose to use just fruits. I also think it is prettier that way. 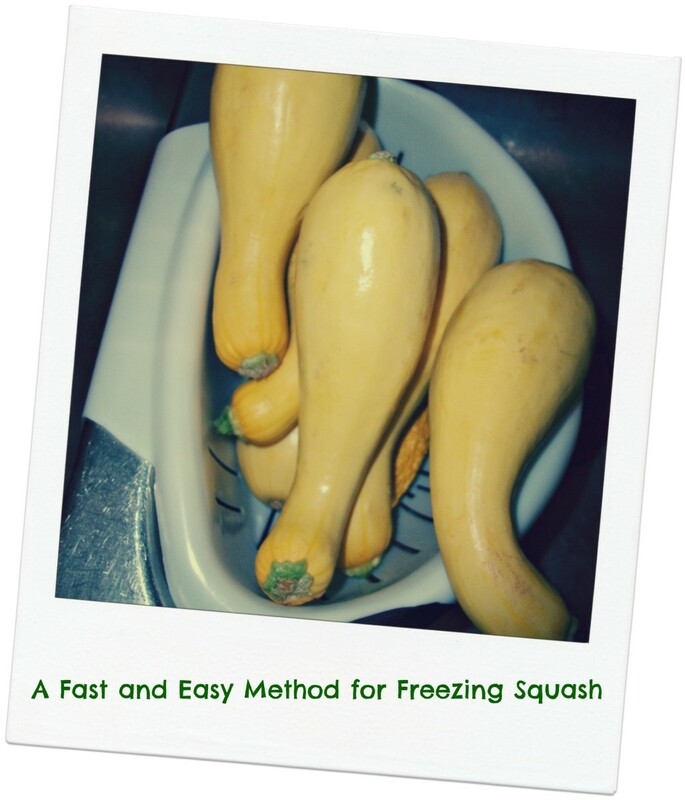 I recommend that you try to use seasonal fruits. They usually taste much better and are less expensive! Watermelon Cake is a big success! The cake, fruit kabob and pizzas made for a bright, festive table. They were a big hit with both kids and adults. The kids loved having their own kabobs to munch on and the pizza slices were pure fun. I would never have thought to put coconut on watermelon but it turned out very tasty. Unfortunately, there are no pictures of the pizza but I will be sure to remedy that soon. 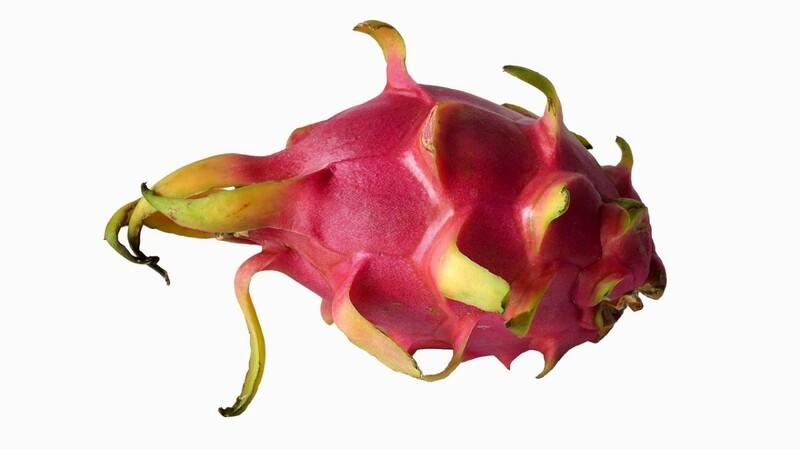 What is Dragon Fruit & How to Eat It? Exactly, Audrey! My daughter was vegan and I wanted to find something thatcwas healthy, pretty and fun! And watermelon is so good for you!! Thank you, Patricia! It's a fun one! I hope you enjoy! How clever is that...I play cards with friends and we all bring a healthy appetizer to munch on between hands. I will have to take this to our next part. Thank you, poetryman6969! They were fun o make and the kids were all grabbing them as fast as we put them out. The cake, however, was a bit more difficult to eat! I like the fruit kabobs. They look like they would be fun to make and to eat. Cutting up fruits into fun shapes looks like good way to keep kids interested in healthy food. Thank you, Heidi! I am not a baker, either, do this cake is right up my alley! I appreciate the comment and votes! March, thank you so much! I haven't had the frosted kind yet but have heard good things about them! Since I'm not good at icing a regular cake, I shudder to think of what a mess of make of this! Mary, thank you so much! It was really fun and though I didn't get any good pictures of it, the pizza one was really cute, too! I hope you and your family enjoy it! Bobbi, thank you so much! I hope you enjoy making it as much as we did! I truly appreciate your visit, comment and share! You have a wonderful 2015, as well! Thank you, Hezekiah! I hope you and your daughter enjoy making it as much as my daughter and I did! Thank you for visiting my hub! vocalcoach , thank you so much for visiting, commenting, sharing and pinning! You are so appreciated! We really enjoyed making it so much that it is becoming a "tradition" here. Heck, I think I could even "bake" this one successfully! :) Great idea and photos. Voted up, useful and beautiful! Yum! Perfect for a party or for hot weather. I was first introduced to watermelon 'cake' this past summer & I thought it was brilliant. A friend had a huge chunk of watermelon trimmed to a 'cake' shape, covered with whipped topping and decorated with sliced fruit & some berries. It was heaven. And it was almost guilt-free decadence. Not only is this a great idea but one I have to share with my daughter. I bought her one of those poppers because her son eats so much fruit. Wait'll I tell her about your brilliant watermelon cake! Voted up, useful, and interesting. A five star recipe. What a delightful idea and I will revisit this hub in the summer when Florida watermelons are plenty and try it by your instructions. I will share with Twitter and put it on my re-pin board. This look excellent and tasty, thanks for sharing. Something to make with my daughter. A watermelon cake! How original and creative. So healthy and perfect for we vegetarians. Voted up, useful, awesome, beautiful, interesting and will pin and share. Just perfect! I hope you enjoy it, dilipchandra! Thank you for your kind comment! You're welcome, Ryem! I hope you enjoy it! I've been looking for something like this! Thanks for sharing. Thank you, DDE! It was a cake I was proud of and will make again! Awesome ideas and always worth the try. You are so right, Sunshine625! Like me, you are also living where it is hot most if the tune. Watermelon his the spot! Thanks for stopping by! Agreed, Lori! I'm not sure rusty type of frosting they use but I've seen pictures of them! I'm thinking that any frosting will slip off the wet surface of the watermelon. Toothpicks should do the trick. Thanks! Hi Lori P.! The glaze does just melt in. It also doesn't hold super well which is why I used toothpicks, too. You could use a little frosting if you want a stronger hold. A question: Does the glaze harden on the cake or does it melt? Cheeky Kid, You should definitely make one. It is delicious. Thanks fir stopping by. That looks really delish and oh-so-creative. Maybe I should make one. Thanks, Susan! It was both! So colorful and yummy looking! Mmmmm... . Yummy and healthy! Love it, Randi! That's true, FlourishAnyway . Those places charge a ridiculous amount of money for something that was actually really easy! Thanks so much for stopping by. I love the kabobs as well as the cake, and I'm sure you saved a ton of money rather than ordering one of those fruit bouquets. Wonderful job! Thank you, Susan! It was yummy! Welcome to Hubpages! Thanks for checking out my hub! Looks delicious and oh, so cool! Thank you so much, Carrie! It was a lot of fun to do! Welcome to my hubpage! Your visit and vote is much appreciated! Thank you, Jackie! It has been a hot summer and watermelon is always refreshing! I hope you enjoy it. Thank you so much for the vote and share! Hi Rebecca. It is a fun way to get those fruits in. While the kids mostly enjoyed the kabobs, they got a kick out of picking the "icing" off the cake! Thanks for stopping by! Thank you, Mike! It was a big hit! I appreciate your visit! Thank you, Cris! You are so right about the season. My bad. I just haven't haven't been writing or posting at all. I decided it could be an end of summer/Labor Day treat! Thank you so much for the great comment! Thank you Susan! It was yummy! LadyFiddler, you can make it with different fruits instead. If you like honeydew or cantalope, that would work! Thank you for reading the hub and commenting even though you don't even like watermelon! How creative! Love this and will try it. I have made the watermelon baskets before, but never would have thought about a cake. What a great idea! I am really craving watermelon this summer more than any other and this looks like a fantastic idea! It is on my very soon to do list! I have the watermelon just have to pick up the trimmings. Up and shared! How clever! I love watermelon and this is a good way to get a healthy dose of fruit. This looks like just the ticket for a hot summer day. Both colorful and refreshing, I am sure your guests were happy. This is so cool and sounds like a lot of fun to do. Too bad, patio and picnic time is almost over but hey there's always a party to be had indoor. Hi hi this looks very interesting and tasty though i hate watermelon with a passion. Just smelling it upsets me . UGH. Same here, Bill! Since my daughter's decision to go completely vegan, I have been looking for tasty alternatives. This looked like fun. Thanks for stopping by. You guys will love it! This is creative, yet doable and delicious... I will be trying and sharing with friends who will agree. You are amazing in all you do, girlfriend! How is it that I have never heard of this? I didn't even know it was possible to make this, Randi. Well, live and learn, and you can bet we'll be trying this soon. Thank you! Thank you, Lori! And welcome to my hub! Thank you so much, Peg! I appreciate your vote and pinning! I am sure you will enjoy making it and I hope it will be a hit at your next celebration! This is a great idea for a healthy alternative to a floury cake. It's pretty, too. Will definitely keep this one in mind for the health-conscious/gluten free, etc. This looks so refreshing and when it's too hot to bake, this is just the ticket. I have many relatives who are vegans, so this will be a winner for our next celebration. Five stars for your creativity and instructions. I'll be pinning this to my Food Ideas board. Thank you so much, Frank! It was fun! Thank you for being my first commenter!